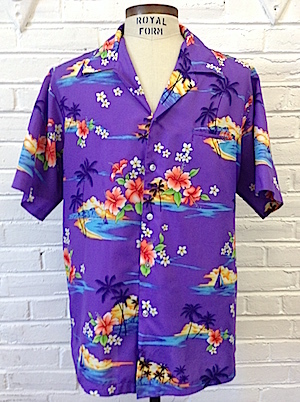 Home > Men's Vintage Shirts > Hawaiian Shirts > (XL) Mens Vintage Hawaiian Shirt! Purple W/ Neon Orange Hibiscus Flowers & Sunset Beaches! 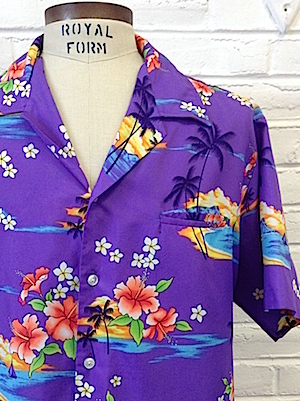 Mens vintage 1970s Hawaiian shirt! Vibrant purple base with neon orange hibiscus flowers and sailboats approaching a beach framed by palm trees at sunset! Closes in the front with pearly white buttons with one pockets on the chest. Shirt has a straight hem. 100% polyester. Made in Hawaii.